*Claire’s Closet earns a small % commission on items purchased via our blog. In fact they are my FAVE – nothing is more flattering! SAY NO MORE!!!!! I not only wear my Lulus on the regular, but they are some of my favorite wardrobe pieces for special occasions. Most recently this winter I used them in what turned out to be my favorite family photo session of any we’ve ever had. Pro Tip: Do your family pics now for next year – they’ll look pretty and wintery and you’ll have one less major thing to accomplish during the fall and holiday bustle. I’m 5’4″ and 138 lbs right now, plus 38 years old, and my legs have never been my fave. Once as a teen I was sobbing about a bad haircut and my mom grew exasperated and said “JEEZ Lisa, she cut off your HAIR, not your legs!! !” To which I replied “But I had NICE HAIR I don’t have nice legs!!!! !” Ah, the teen years. Can’t wait! But Lulus are magic. I’ve learned to love my legs when I’m wearing them. The Lulus you’ll want when you’re not headed to the gym are the “Wunder Unders, and you want to snag one of the “Full-on Luon” options – that’s going to be their tightest knit so it’ll give you the most coverage and support (read: most flattering), rather than the “Luxtreme” which is a lighter knit designed for running. Specifically, my go-to is the Full-On Luon and I do a 7/8 Crop since I’m on the shorter side – if it’s winter, my boots cover it and if it’s summer, I want the crop. I wear a size 8 and again I’m 5’4″ and 138lbs. The color selection will vary with season; here’s a shot of me in the black. They were PERFECT for layering on a hot weather vacation last year; I paired them with a tank tunic for the heat and a zip down for places with AC. Nope, Lulu leggings aren’t cheap – that’s the catch. But I’ve tried many brands due to this line of work and they really are the best I’ve found in terms of flattering and comfy, and a black pair especially is a super basic wardrobe piece that you’re going to get lots of use out of – especially because they last forever. And they travel easily – small suitcase footprint and no wrinkle worries. If you have any Lulu pics or if you want to chat mommy fashion, join us in our Facebook Group! Happy Thursday y’all! I know a lot of my followers are younger… but the younger generation is starting earlier than mine did with *preventative* anti-aging skincare (rather than just treating the wrinkles as they appear). Whether you’re 25 or 38 (like me), you’ve been hearing a lot about Vitamin C lately. And you’re wondering what happened to Retinol!! First, what does the Vitamin C/Ferulic Acid combo DO?? Okay sounds good! But what about Retinol? From what I could gather in chat groups, people are using retinol at night and Vitamin C in the morning; Retinol makes your skin extra sensitive to light so it’s not recommended for morning use. No problem… it’s only $166 per ounce! Check it out here. Patented formula (optimal, lower Ph) and phenomenal reviews by those who have tried many brands, but be aware that the SkinCeuticals brand option is pricey! Check it out here, at Dermstore – you might be able to get 20% off your first order by signing up for email alerts. But wait! She also says “there are cheaper alternatives where you can get most of the benefits without the high cost.” She linked to this one, “Timeless” – the cheapest I could find it for was $19.95 at Walmart (ships FREE!!!). There are Amazon listings too, but currently only 3rd party sellers and reviewers are questioning the authenticity of their product, and having product arrive seeming old and already oxidized (you’re actually going to want to store yours in the ‘fridge)! Excellent and FAR cheaper alternative! Best price on the Timeless brand is here. So there you have it! The scoop on Vitamin C + Ferulic Acid and your top two options to purchase. If you try one of these out, or if you’re already into it, chat with us in our Facebook Group! * Claire’s Closet earns a small % commission on items purchased through our links. So super cute you’d seriously wear it on a date?! To score a great price on these (or any other shoes), just subtract 1.5 sizes from your women’s size and order your youth size! Ex: Size 7 women’s is size 5/5.5 youth! Snag the pink/blush color for only $49.99 here, or $63.23 here (still a STEAL) if that listing sells out. Again, just subtract 1.5 sizes from women’s to get to your youth size. Snag the gray/silver options shown for $69.95 here. Snag the ivory w/coral trim for only $54.99 here. Wearing a larger shoe size? No problem! Check out the current Sperry listings on Sperry’s site, Nordstrom, Zappos, Dillards, and Macy’s. We’ll be following these and chatting all about them our Facebook group, so be sure to join! *Claire’s Closet earns a small % commission on items purchased through our links, but none of the items shown were provided to me for this post. This is reblog from another blog of mine. This pic shows a half-batch; you’d normally use a 9×12 pan. This is BEFORE icing. If you’re not Swedish yourself, you might not know it by name. Even so though, you’d probably associate the taste with Christmas (or winter) if you had a slice of cardamom bread. It’s a spice made from the seed pods of various plants in the ginger family – and it’s a big time staple in Scandinavian baking. Every Christmas my (Swedish – but like, 3rd generation) MIL bakes what must amount to 20 loaves of cardamom “coffee” bread, and my husband’s gigantic family eats it for days on end – sometimes toasted with butter and sprinkled with cinnamon sugar, other times topped with a slice of jarlsburg cheese. If you’re up for a major undertaking, I blogged her recipe before here. 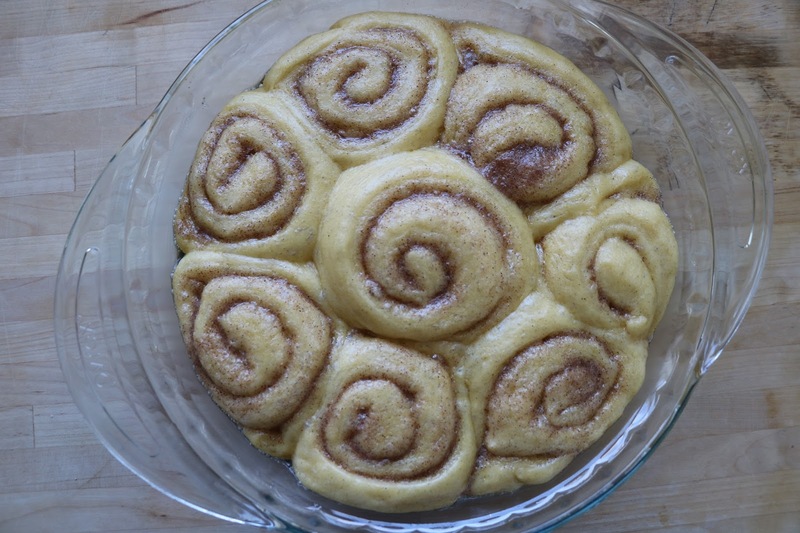 But stay awhile, because these little rolls are much easier to make – and they’re soft and moist and gooey. 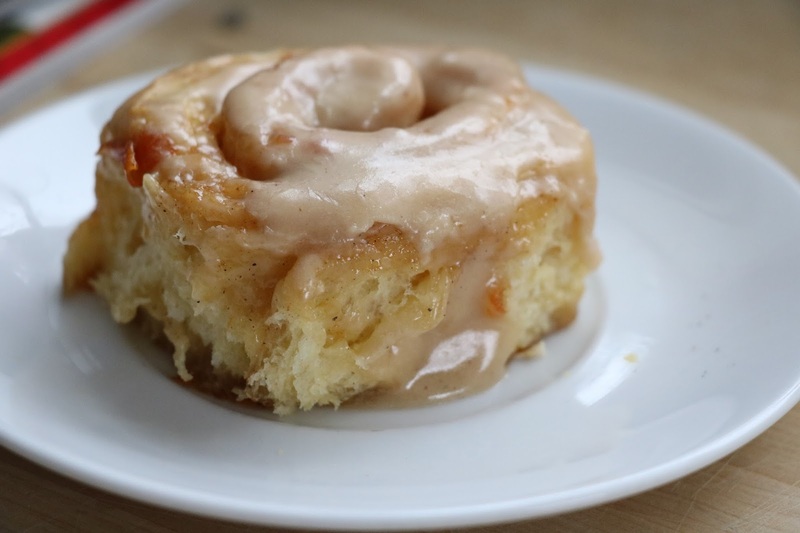 They pack a delicious burst of cardamom and they are simply to die for when you slather them with maple-coffee icing. 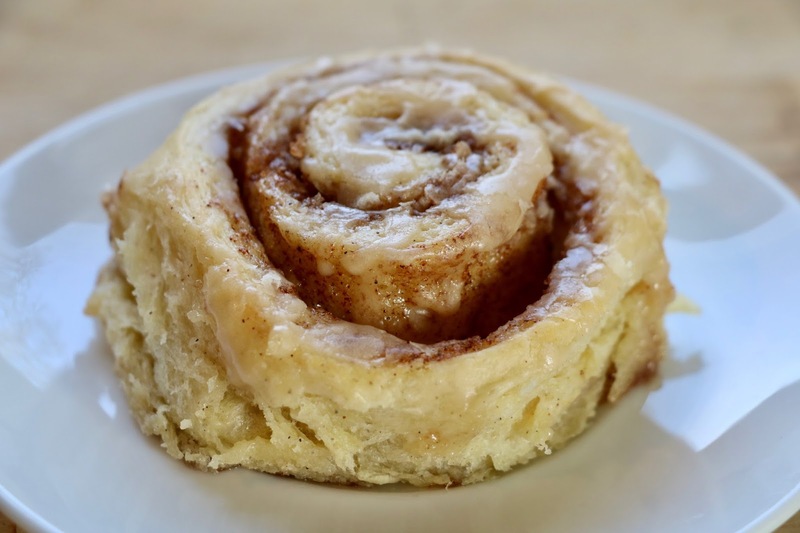 The dough recipe is a real gem; it makes exactly enough for a 9 x 13 pan of about 12 rolls, and it’s easy to make and easy to work with. 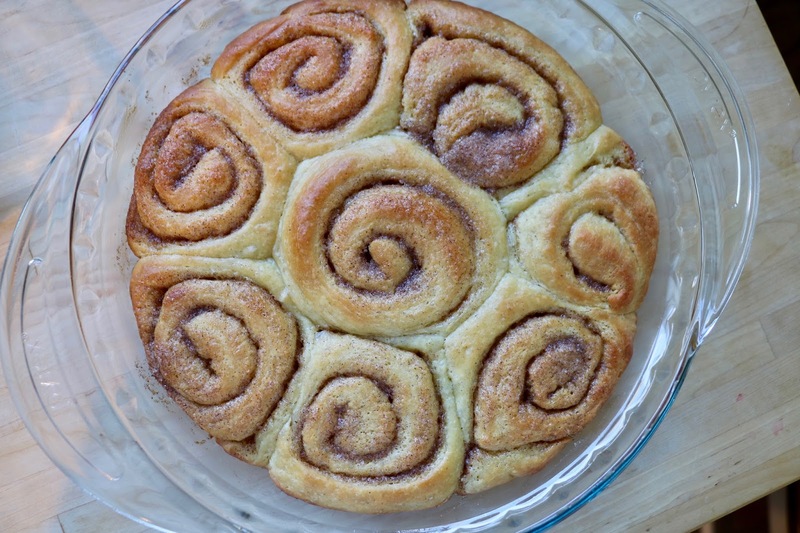 I now use it for our Citrus Sweet Rolls… it’s SO easy to whip up, I made five different batches of rolls last week so that I could experiment with different fillings and icings. 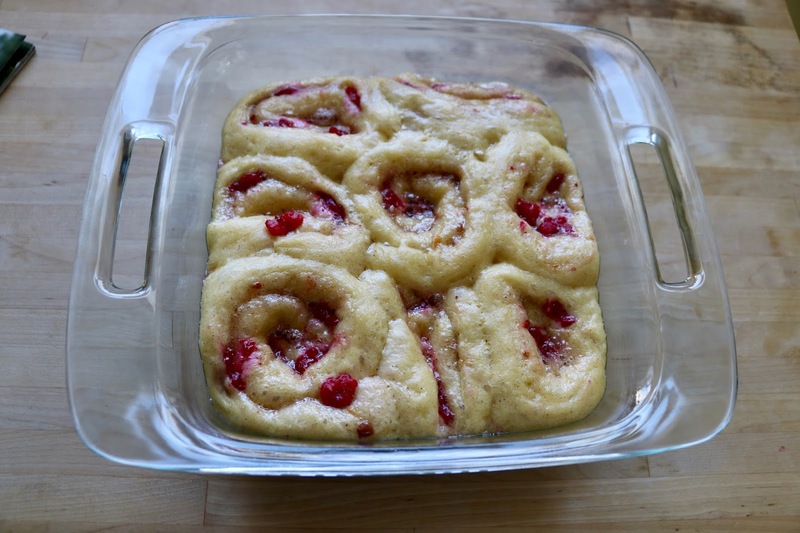 This one and the Citrus Sweet Rolls were the winners, but don’t miss the raspberry variation (below) – also SO good. 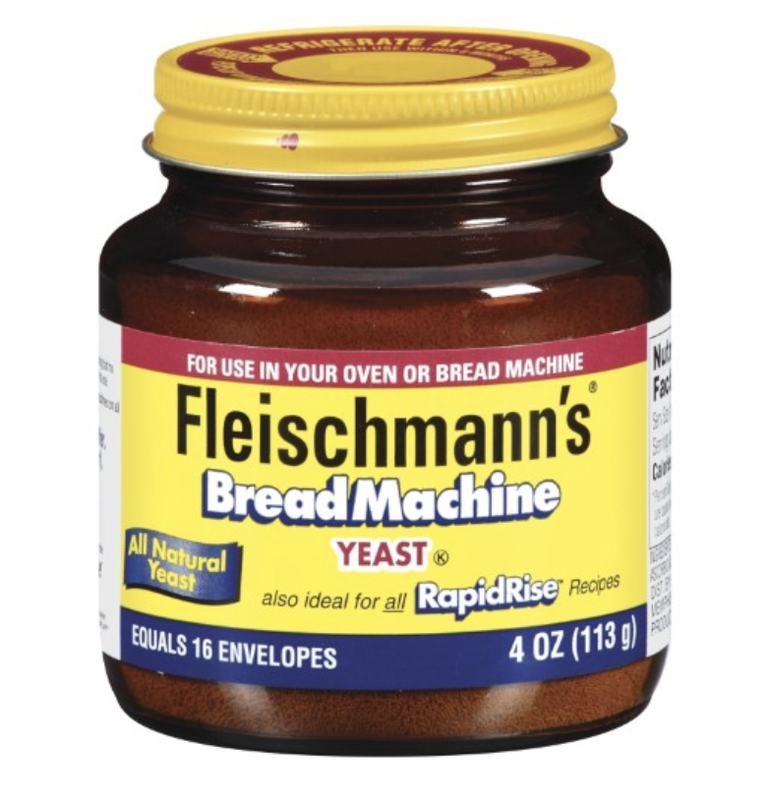 Here’s a pic of the instant yeast I used. We do NOT have a bread machine. Place the flour, sugar, yeast, and salt in a mixing bowl (1tsp cardamom too if you’re adding it). Melt the butter in a saucepan and add the buttermilk – this should bring it to a little warmer than room temp (too hot will kill the yeast), swish it around in the pan to mix it, then add it to the bowl of dry ingredients. Lightly whisk the eggs – just use the same pan you used for the butter/milk mixture, and add those too. Mix in mixer a little until it comes together – use a dough hook attachment if you have one – then knead with your hands for about 7 minutes. If you do this on a baking mat you should not need to add ANY extra flour or make ANY mess (see pic below!!). Place in a lightly greased or oiled bowl and flip it over so the top of the dough is also greased. Cover (I use a wet dishcloth for moisture, you can also use plastic wrap) and let rise in a warm place (I turn my oven on and off briefly so that the oven is slightly warm) for 2 hrs or until doubled. I can’t say enough about these baking mats (and they’re cheap too!). It is practically miraculous how the dough does not stick to them at all, even without flouring them. 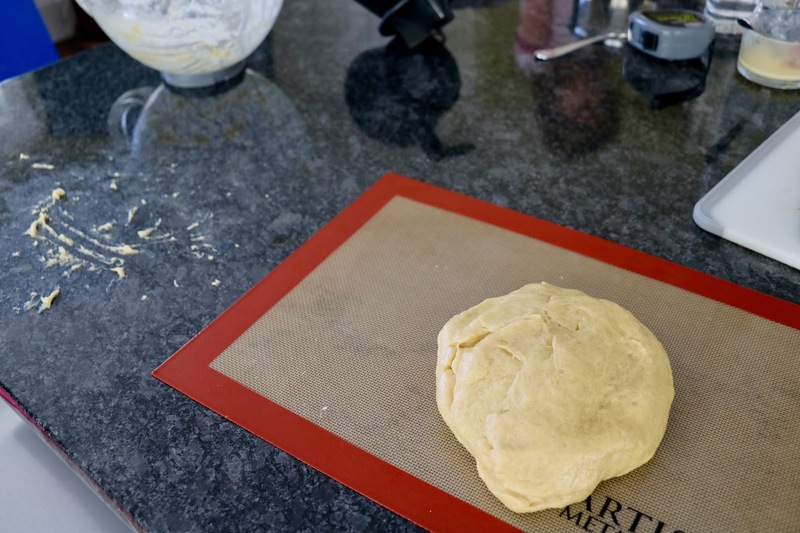 This pic shows a side-by-side comparison of what happened when I kneaded the (very moist) dough on the countertop versus the mat – you can see how it stuck to the countertop but not at all anywhere on the mat. You’d be fine without one, but you’d have to add flour. While dough rises, prepare the filling. Simply mix everything together. Then grease or butter a 9 x 12 inch baking pan (just the standard size; in the pics here I split the batch in two, and used two smaller pans). Punch dough down, and again turn it out on lightly floured surface or baking mat. Roll until it’s about 18 x 12″ (doesn’t have to be perfect). Examine the filling – if it’s pretty soft, just spread it evenly all over. You *may* want to stick it in the microwave briefly, just to soften it for spreading, if it’s not too soft. Roll up, starting at one of the longer (18″) sides. 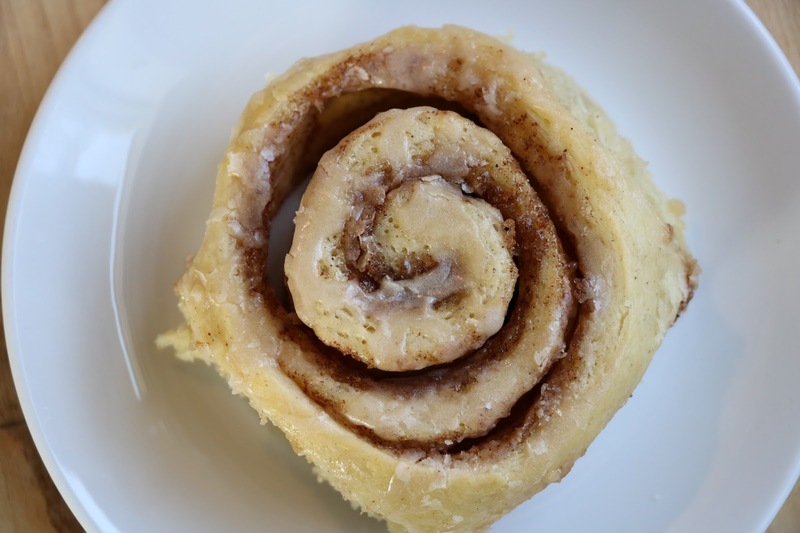 You can definitely pull and stretch the dough as you go, if you prefer thinner roll “walls” and more of them. Once rolled up, slice it into about 12 slices (so, 1.5 inches each to make 18 inches) – doesn’t have to be perfect!! By the way, I’m told unwaxed floss is great for the slicing, but I use this dough cutter by OXO – it’s cheap and it’s also really handy for scraping dough or flour off surfaces and into the trash (you won’t need it for that though, if you have the baking mats!). Place the slices as evenly as you can in the prepared baking dish. At this point, you can cover and refrigerate overnight if you prefer! 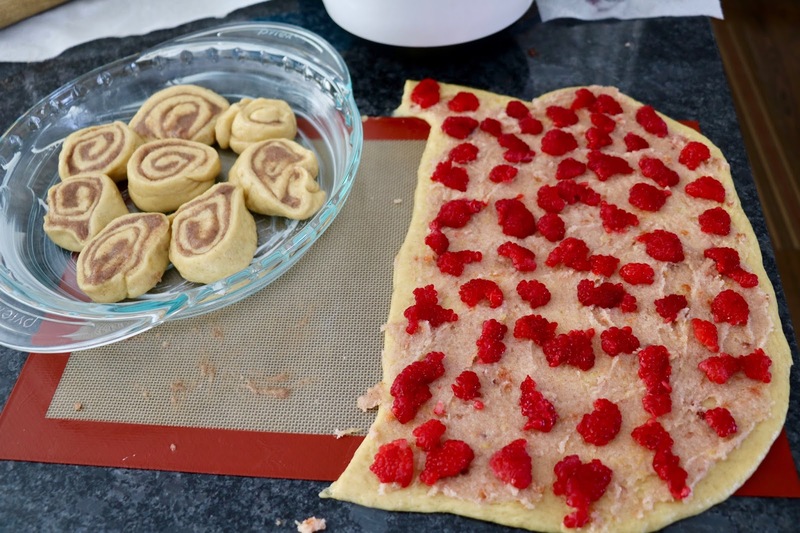 In this batch, I used half the dough for regular rolls, and half for the raspberry variation) *****See that piece of dough at the top that goes beyond the mat? It stuck to the countertop, but NOT to the mat!!! Cover (I used the same moist dishcloth but you could use plastic wrap) and then let rise again, in a warm place, for about an hour, until rolls are all touching each other and appear to be the proper size for eating. If you refrigerated overnight, you likely need to let them rise an extra 30 minutes or so. Then bake at 375 for 15 minutes, or until lightly golden on top. Do not overcook!!!! Or undercook. It’s worth it to test a roll with a knife, you can just eat that one later. While it cooks and cools a bit, prepare the glaze. Just add everything in and whisk it up OR mix it in the mixer! Cover with the glaze – I actually only use about half the glaze recipe, and I drizzle it, because I don’t like a lot of icing. I save the other half and make more rolls eventually; it keeps really well. But if you’re an icing lover, feel free to slather it all on! Serve. Heavenly!!!! It simply doesn’t get better than this!!!! 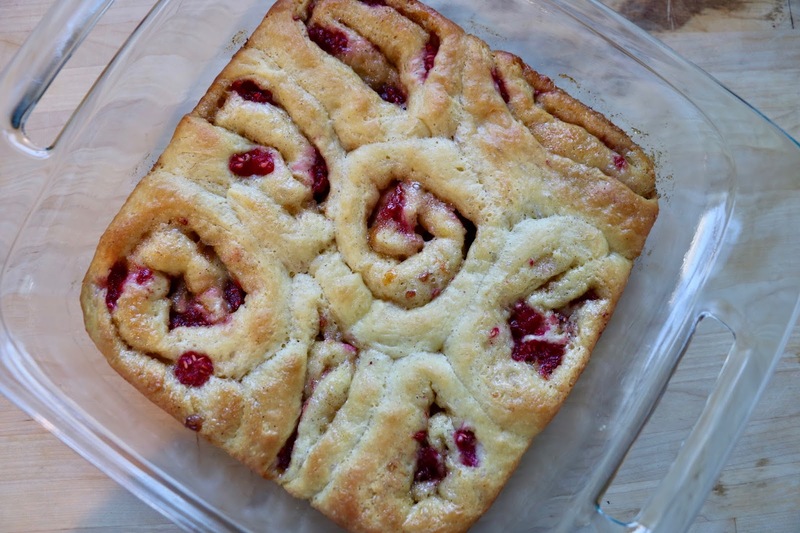 Raspberry Filling Variation: For a fresh raspberry edge, add to the above filling recipe 2 tbsp of raspberry preserves (I used raspberry-apricot by Bonne Maman) and the zest of one lemon. 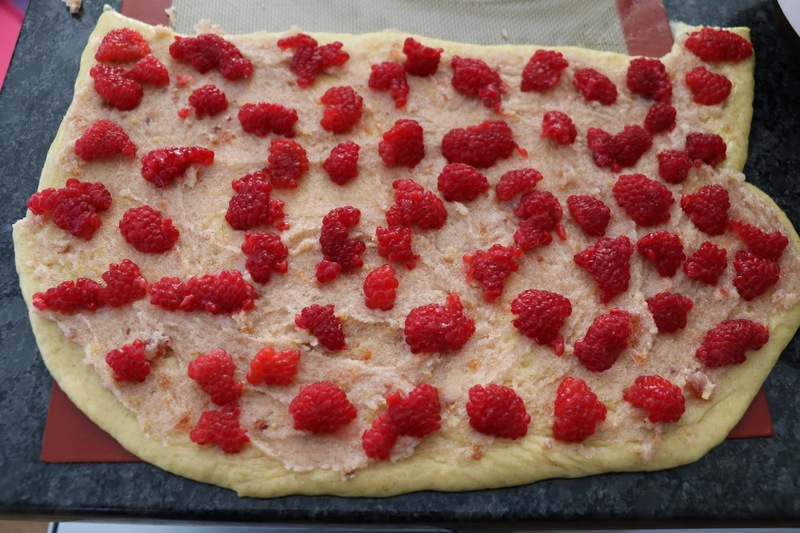 Then rip some fresh raspberries and set on top of the filling before rolling. *Claire’s Closet earns a small % commission on items purchased through our links, but none of the items shown were provided to me for this post. We kicked off Advent with the calendar my children cherish from Pottery Barn Kids. I bought ours long, long ago – back when my eldest was barely 12 months old; this has been a lifelong dream of mine. And it hasn’t disappointed – when I asked my kids what they were most excited for this Christmas, they said their advent calendars. While you can of course do little candies or treats, you can also throw in activities (“Make Christmas Cookies!” “Do One Nice Thing For A Neighbor!”) to up the memories made. BONUS: There are still some left and they’re now on clearance, so you can start late or hoard one for next year – use this link! NEW to our holiday speal this year are “Christmas beds” (so named by my kids), also by PBK. Long story short, we put our house hunting on hold and I gave myself this bedding as a consolation prize. Honestly… it’s been a pretty good one! I am so eager to finally start making memories in a permanent home, but this bedding went a long way toward making up the fact that we have almost no space to decorate and no mantle. The top bed is current line (“Heritage Santa”). The bottom bed is a past season’s line I got off Ebay, so that my kids would each have their own thing. We still need to get our tree and hang our stockings, but that didn’t stop us from getting our bake on yesterday! I’ve said it before, but these mats are a TOTAL game changer for baking. The cookies practically slide off of them once baked. Ours aren’t as fancy as many these days, but if you like a super soft cookie and if cream cheese icing appeals, they’re pretty perfect in their own way. Check out that recipe here. Whew! And it’s only December 3rd! Join our Facebook group to see all my best-find products and deals! Follow me on Instagram (I’m totally new, so I’ll REALLY appreciate it)! BODEN’s Black Friday is LIVE – top Picks! *Claire’s Closet earns a small % commission on items purchased through our links. Eeeeeeee you guys! Hurry over to Boden where you get a whopping 30% off your order, plus free shipping & returns at $49, with code V4N9! Their entire holiday line is just gorgeous this year – women’s, men’s, AND kids’! It’s so hard to choose, but our top picks for Claire’s (actual, haha) Closet ended up being the Fair Isle Knitted Dress and the Festive Friends Sweater. Both run true to size. She picked the Fair Isle Knitted Dress. Those Christmas trees and snowmen did her in! I picked the “Festive Friends Sweater.” Every year we have a “snow day” outfit (not just for literal snow days, but any day we wake to fresh snow!) – this is perfect! I recently read an article detailing “The Norwegian Secret to Enjoying a Long Winter.” It turns out that they see winter as something to be enjoyed, rather than something to be endured. Now… I’m not quite sure I’ll get there 100%, but I have to say that our snowy days are absolutely brighter and more fun with such sweet, cozy outfits! You can check them out here. LOVE!!!! Shop the full Boden Black Friday sale here. If you’ve got your own real-life pics of Boden’s winter line, we’d love to see them!!! Join the Claire’s Closet Finds Facebook group and post them as a comment on our Boden thread! And don’t forget to follow me on Instagram! Fave Find Lately – Science Tee! Just a super quick post on an awesome find! My scientist friend found this one and it’s *so* cute and a great price! With a fabulous girl power message! Just a hint of glitter because – why not?! You can have glitter *and* science these days (at long last)! The “experiment” shows that if you start with intellect (and apparently distill it) and then add courage, goals, belief heart, strength, and honor, you’ll get to girl power. Sounds like a plan to me! And for $7.00, sounds like a great grab (free ship at $35 or with red card). Shop it here! Claire’s Closet receives a small % commission on purchases made through our links. Dark Chocolate PB Cup Cookies – My Fave! When a recipe gets five full stars from over 6k reviews on allrecipes.com, you *know* it’s a keeper. I didn’t alter much here but the change I made is, in my humble, dark-chocolate obsessed opinion, pretty significant. If you swap out the standard Reese’s cups for Trader Joe’s dark chocolate version, your final product will be ever-more intense and you’ll spend a fraction of the time unwrapping. I also skip the whole “mix the dry stuff separate first” – is that ever really necessary?? This recipe looks tricky but it’s actually not. It’s perfect any time but we especially love the colors for fall and winter. 1 package Trader Joe’s dark chocolate peanut butter cups. Minus a few you snacked on. Unwrap your peanut butter cups. Stick them in the freezer. Preheat oven to 375. Mix the butter, sugars, and peanut butter together until fluffy. Add the egg, vanilla, salt, and baking soda. Add the flour and milk, alternating a little if you can. Scoop into ungreased, nonstick mini muffin tins. Super easy if you have a cookie dough scoop – it’s just the right size if you level it off. Bake 8 minutes. Remove pan from oven and immediately press a peanut butter cup into each “muffin.” Let cool until easily removable from pan (10 minutes)? Remove from pan with fingers. Voila. So easy!!! No need to grease the pan! Just push the frozen pb cups gently into the freshly baked dough. Let cool slightly (5 mins) then gently lift out. Claire’s Closet uses affiliate links so that we can earn commission on products discussed or mentioned in our posts. This recipe was a reblog of a post I originally wrote on another blog.